PWTech/AET Deep Shaft: Fully-automated, patented vertical treatment shaft process for CSO control, an alternative to basins, tunnels, and separation. Process Wastewater Technologies and Applied Engineering Technologies (AET) have partnered together to develop a fully-automated, patented* treatment shaft process for CSO control systems. 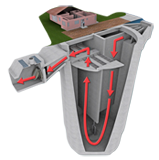 The technology provides proper disinfection contact time, vessel flushing, air venting, odor control, surge control, skimming, and settling in a footprint that is less than 15% of a surface storage system. During wet weather conditions, water flow rises over an upstream interceptor weir and begins to fall into the treatment shaft, while chlorine is automatically injected prior to the upstream weir via chemical mixers. The shaft fills and floatables are trapped on the upstream side of the shaft's baffle wall. Solids settle in the shaft due to the low flow velocity within the shaft. As the shaft fills, the PWTech Raked Bar Screen activates and traps screenings of mostly neutrally buoyant materials in the waste stream while allowing water to flow to the river. As the storm event subsides, dewatering pumps activate and the water screenings and floatables are drawn down to around the 10 ft level. A flushing mode begins and a high-pressure nozzle system is used to keep settlables in suspension. The dewatering chopper pumps continue until the shaft is emptied. The shaft is injected with an odor-neutralizing solution (optional feature). Contact PWTech engineers for help with system design. Click here to learn more about Applied Engineering Technologies. * U.S. Patent No. 6,503,404 and 7,341,670. Other U.S. and international patents pending.